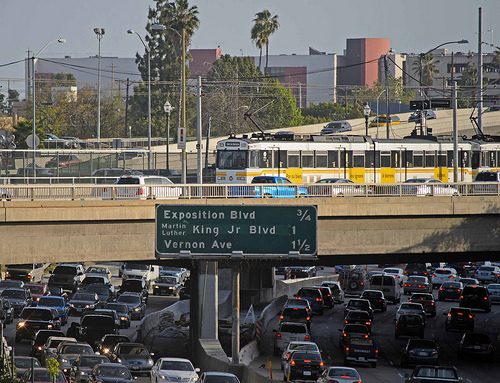 Fly over traffic on your way to the L.A. Marathon finish line this Sunday, Mar 9. The Los Angeles Marathon returns on Sunday, March 9 with the ‘Stadium to the Sea’ course running once again from Downtown Los Angeles to Santa Monica and again your best course of action is to use the Metro Rail system to see all the racing action. Metro Rail service will run as scheduled. Spectators are urged to ride Metro Rail to reach viewing areas and affected bus customers are urged to take Metro Rail to avoid lengthy bus detours and delays. Metro will run free, non-stop bus shuttles beginning at 5 a.m. between the City of Santa Monica and the Culver City Expo Line Station. Patrons can board Santa Monica-bound buses on Washington Boulevard just south of the Expo Culver City Station. Culver City-bound buses can be boarded on Olympic Boulevard and 11th St in Santa Monica. There will be interruptions in Metro bus service along the route. Lines normally passing through those areas will be rerouted and many other lines will be disrupted. Patrons are urged to plan ahead and allow for extra time during the race. Listed here are the Metro bus lines which will be disrupted before and after the running of the Marathon. Affected Metro bus lines: 2, 4, 10, 14, 16/316, 20, 28, 30, 33, 40, 45, 48, 55, 60, 68, 70, 71, 76, 78/79/378, 81, 83, 84, 90/91, 92, 94, 96, 105, 156/656, 180/181, 200, 201, 204, 206, 207, 210, 212/312, 217, 222, 485, 487/489, 534, 550, 704, 720, 733, 745, 754, Silver Line (910). Regular service on some lines will be restored as the race progresses but full service on all lines is not expected to resume until approximately early evening. Metro apologizes for any inconvenience you may experience on this day and thanks you for your cooperation. For further assistance, please call 323.GO.METRO. For Metro Rail route and schedule information visit the Metro Trip Planner at metro.net. Due to technological limitations, short-term, temporary bus detours are not reflected in Google Transit, Metro Trip Planner, or NexTrip real time bus arrivals. Stay informed by following us on The Source and El Pasajero at metro.net, facebook.com/losangelesmetro, twitter.com/metrolosangeles and twitter.com/metroLAalerts and instagram.com/metrolosangeles. Shout out for those who will be doing the Marathon Crash bike ride before the marathon begins. Make sure you don’t miss the last trains or connecting trains to get to the starting location! Will your buses/ shuttles between Santa Monica and Culver City Expo have bike racks? Yes, the shuttle buses will be regular Metro buses and will have bike racks available. Please tell me that by the time it’s time to go into downtown for dinner (probably 5:30), and the Ann Elise Smoot recital (pre-concert lecture at 6:30, curtain at 7:30), at Disney Hall, all this mess will be over. The marathon closes 8 hours after it begins – so around 4 p.m. But streets will open on a rolling bases shortly after the race starts, meaning all downtown street closures should be over around noon. Depending on which direction you’re coming from, you might still run into some detours, but for the most part by early afternoon the closures will only be around Santa Monica. Same as always: up the Blue Line from Wardlow, then dinner (probably either The Counter or The Pantry — Engine Co. No. 28 has gone a bit downhill in the past year, and Clifton’s evidently hasn’t reopened yet), then the Red Line to Disney Hall, hopefully in time for the pre-concert lecture. When the shuttles between Santa Monica and Culver City stop operate? it says the service starts at 5 am but when it finishes? Paul, Last shuttle departs Santa Monica at 6 p.m. This is related to the Marathon but not to public transportation. As a participant in the Marathon, I, and probably hundreds like me, will be driving the 405 southbound to Santa Monica in the 3 a.m. hour to catch a shuttle from Santa Monica to Dodger Stadium in the 4 a.m. hour. Can we count on all on-ramps to the 405 southbound to be open overnight in the early hours of Sunday, March 9? We need to plan ahead (and not just the night before) if any on-ramps will be closed. I am especially concerned about the Skirball on-ramp to the southbound 405. Also, can we count on the connection from the 405 southbound to the 10 westbound to be open at that time? Thanks. I understand your concern and will look into it. In the meantime, you can check the project page at metro.net/405 to see the construction notices, or direct questions to http://www.twitter.com/I_405 or Facebook at http://www.facebook.com/405project – it’s possible they can respond more quickly as I’m checking with them as well! How would I get to the Century city mall on Santa Monica and Avenue of the stars on marathon Sunday? I usually take the 4/704. Due to the rolling detours, it would be best for you to call customer service at 323.GO.METRO prior to starting your trip so you can get the most accurate, up-to-date information about any detours that might still be in place. Does this include taking the “Gold LIne” which is having up to 20 minute delays because one of its cars STRUCK A CAR! Nothing like the MTA to promote use of its rail system that then CANNOT DELIVER RIDERS TO THE EVENT THEY ARE PROMOTING!